Totana.net - "Looking to the right ..."
"Looking to the right ..."
Looking to the right, we waited like May water the statements of D. Juan Pagán to be able to give a certain opinion about what our Regional Deputy and "first sword" that the PP of Totana wants to offer us as a candidate to occupy our City Hall. First impressions have been given to a local media and refer to his candidacy and future projects. The experience in politics can be as good as pernicious. and not by "politically correct" statements of which we are more than fed up. Because: "facts are loves and not good reasons". Currently, Mr. Pagán is a Regional Deputy of the Popular Parliamentary Group for District No. 1 (Lorca, Ã�guilas, Puerto Lumbreras, Totana, Alhama de Murcia, Librilla, Aledo and Mazarrón) and has registered FIVE motions in four years (sic). Many of us already did not remember that he was one of our regional deputies. In addition, he was Councilor for Agriculture, Livestock, Water, Pedanías and Roads in the City of Totana from 2007 to 2011. The legislature of the collapse of the economy of our municipality. With this curriculum, it could be said that: is the best candidate next to his party, which could have the residents of Totana to deal with the great problems that are unresolved since Mr. Pagan himself was a Councilor in Totana with his party and to the present, being Deputy of our Region for a constituency that includes this City as part of it ?. He calls us all to understand each other and to the hackneyed "consensus", well, but we still do not know for what exactly. If it is to fight all with "art" and "courage" the issues that they did not know how to fight when they governed, causing the current economic ruin of Totana, without anything positive that may have contributed in this regard Mr. Pagan from his chair in the Assembly Regional on this or other local issues. Or if the consensus is aimed at what is peace among the people of "order" (in principle) what is presented so that everything remains the same and what does not take many dislikes in the four years that come from "new legislature." But, What has Mr. Juan Pagan done for this city in his years as Regional Deputy? As much as we listened to the interview, we did not draw clear conclusions about it. Of course we will also talk to Mr. Pagan, it would be more. As of June, if the neighbors have a good time and trust us, we will talk to him and everyone, but with less interference and pernicious influences from political parties or interests outside the generals and putting all the letters on the table. More than anything, also understanding this man, as Totana Now understands, that the parties have not been the solution, but the main problem for the residents of this municipality for decades at the time of managing certain issues for which they were " elected "(to say the least) in defense of the interests of the totaneros. 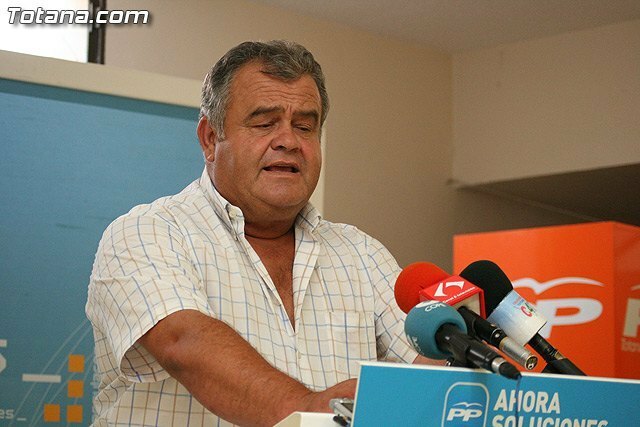 Of course, in that criticism, the Popular Party of Totana, the PP of Murcia and Mr. Pagan himself are included.